— and thanks to those devices, the number of people across Nigeria and the rest of Africa with access has grown tremendously. However, simply having an Internet connection isn’t enough. It’s important that people getting started with the Internet have a great, reliable, and relevant experience right away. This can be a challenge in places where local content may be limited, connectivity slow or intermittent, and quality phones costly. While there’s still much more to do, we’re excited to take a step forward in addressing some of those challenges. Today in Lagos we’re announcing new products and features made to improve people’s experience when using a mobile phone to access the Internet. 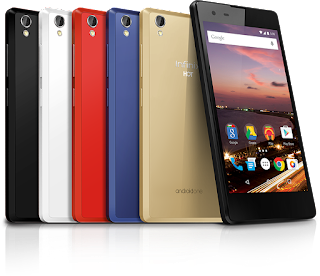 First, the Android One program is expanding to Nigeria, Ghana, Ivory Coast, Kenya, Egypt, and Morocco with the launch of the Infinix HOT 2. This is the first Android One device made with our hardware partner Infinix, one of the hottest, fastest growing smartphone brands in Africa. Starting today, the HOT 2 is available in Nigeria at select retail outlets and online through Jumia at a recommended retail price of N17,500* (~88 USD), and it will become available in the other countries over the next few weeks. Like all Android One phones, the HOT 2 combines a high-quality hardware experience with pure Android software. Bringing together a quad-core MediaTek processor with 1GB memory, dual SIM support, and black, white, red, blue, and gold (with 2GB memory) models, the hardware is a great complement to Lollipop 5.1.1, which provides up to 2x better performance and extended battery features. The Android One HOT 2 will also receive an update to the next version of Android (according to Infinix’s schedule), and thus stays fast and responsive over time. Second, for people who already own a smartphone, we’re helping them get more for their MBs through a streamlined version of Google Search rolling out to devices worldwide and offering a faster experience on low RAM phones, such as those with 512MB. This feature can reduce data usage on the results page by up to 90%, while removing up to ⅓ of the time it takes to load results. Finally, we will make the YouTube viewing experience even better by extending YouTube offline to Nigeria, Kenya, Ghana, and Egypt within the next few months. This feature of the YouTube app lets you store many of the videos on YouTube for up to 48 hours, so you can watch them later when your connection may be slow — or non-existent. And if you want to quickly re-watch a video with friends without waiting for it to load, that works great too. Nearly one year ago, Google introduced the Android One program and YouTube Offline in India. Today, 6 countries in Africa — with combined populations of 379 million people — join the list of places where Android One phones are sold. We’ve been thrilled by the progress and feel humbled by the work that’s left to do. But we look forward to continuing our work with partners to ensure that people have a great way to access the Internet, using it in ways that are relevant and useful. If you’re online in Nigeria, chances are you’re on a smartphone. Of the more than 50 million Nigerians who use the Internet, 95% do so on a mobile device — and thanks to those devices, the number of people across Nigeria and the rest of Africa with access has grown tremendously. Thank you Google for bringing Android one to Nigeria, pls we also need Play books, play music and play movies. thanks. Fantastic Initiative by google. Ordered mine and expecting delivery tomorrow. Keep it up. I don't understand why these kinds of phones are only in "select" markets. They'd do very well in New Zealand. Great One - Android One is simply exceptional...! Its a step up of innovation and I am proud of infinix taking over the market. Tecno and Innjoo why are u guys still asleep? I'm in Kenya, how can I order for one? I see signs of "copy and paste" here from different websites, traces of a post from "gsmarena.com" and some more. Most of the post are in direct speech instead of reported speech since you are the one writing the post.